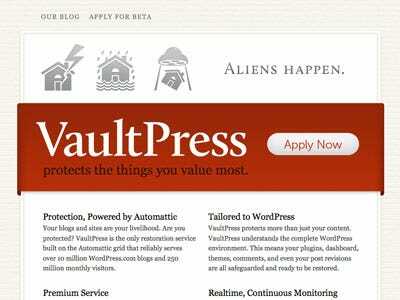 The company behind WordPress is poised to turn on another revenue generating engine: VaultPress, a backup service for WordPress. The service is in beta now — bloggers are being asked to apply to be part of the test group — but this makes perfect sense for anyone with a personal or corporate blog that’s worth protecting. Backing up a blog is actually not a trivial thing to do — you need to think about the database, files, settings, plugins, etc. — and this is where WordPress could offer a simple and reliable service that people would actually pay for. WordPress plans to charge about $25 per month for this service, it appears, via the beta application form. That might be a bit steep for personal blogs, but we could see companies paying $50 or more per month for this.